September 25, 26, 27, 28 & 29, 1984. Alan Ayckbourn has written three plays about one particular country week-end, under the general title Norman Conquests. Each is complete in itself. One play shows what happened in the dining-room, one the events in the living-room and the third the goings-on in the garden. Living Together is the second of the trilogy. If you enjoy this play and would like to see the others, do let us know. BARRIE BOWEN has lost a wife and gained a girlfriend just for five nights this week. 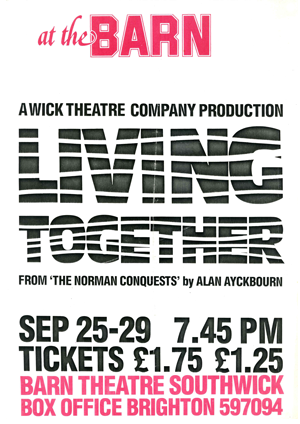 Barrie and his wife Miranda are both members of Wick Theatre Company, and are currently appearing in Alan Ayckbourn’s comedy Living Together, being staged at the Barn Theatre, Southwick. In the play, the second of the Norman Conquest plays, Miranda takes the rôle of Annie, while Barrie plays Tom, Annie’s boyfriend. The action revolves around a weekend at Annie’s home and involves just three couples. In the leading rôle of Norman is Roger Job, with Rosemary Morse playing his wife Ruth. The other two rôles are filled by Pat Moss and Keith Denyer.